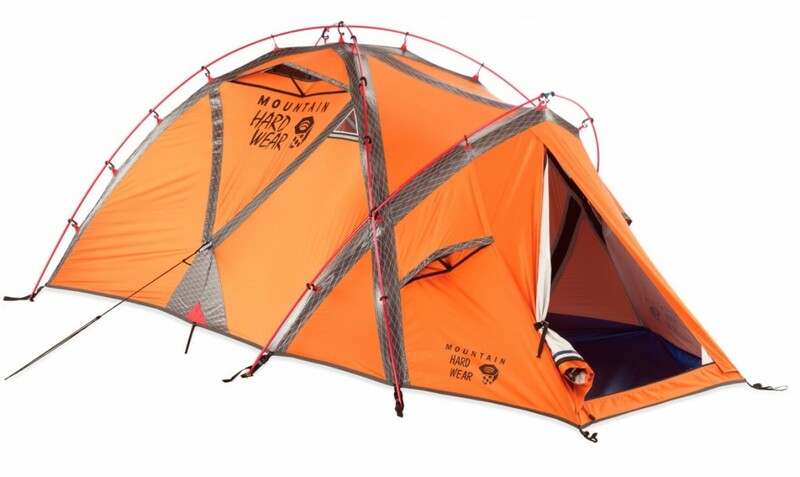 The first thing to note about this tent is that is comes out of a collaborative effort between Mountain Hardwear and Ed Viesturs, who is famous for not only having climbed all of the world’s 14 highest mountains but also for having brought many of them to a wider audience with his prowess as a filmmaker. Mr Viesturs wanted a very light but also roomy tent. The result was a marvel of engineering and fabric. The EV2 is a singled-walled tent. What that means is that instead of having a conventional fly sheet (outer layer|) to keep the rain and wind out and then a breathable inner layer to keep the warmth, the mountain EV2 has just one combined waterproof and breathable layer. They use Conduit, a waterproof fabric with a pretty good reputation, as well as waterproof zippers on the doors. This results in a significant weight saving. This tent weighs just 4 pounds and 14 ounces (2.2 kg), which is about half the weight of other expedition tents. The North Face VE 25, for instance, weighs almost 4.5kg. Setting it up is also really easy, even for one person. To keep the weight down further, while also making a tent that is strong enough to stand up to the winds and storms that it might encounter at 7,500 meters, it has a frame made from Scandium alloy poles. These get wider as the reach the end of each pole, which is where the strongest forces often accumulate and where most breaks occur. On the negative side of things, this tent is small. It is made for two people, but with all your gear you will feel cramped. In many cases a small footprint is great on a mountaineering tent. You want to be able to squeeze your tent into any little ledge you can find. Smaller makes that easier. Yet the lack of space is a problem, especially if you are fairly large Now the cramped interior may be a small price to pay when you are climbing and 8000 meter peak, but for less demanding ascents then you might be willing to trade off a bit more weight for a bit more room. The other area that many people do not like is in integral vestibule. This was a design feature that Mr Viesturs insisted on and, once again, for his kind of climbing it makes perfect sense. By producing an integral vestibule they get to shave a few ounces. But it does mean that you lack the second entrance that is commonly found on other mountaineering tents. These can be useful for keeping driving snow out of the inner part of your tent because you use the vestibule as a bit of an airlock, opening one zipper at a time. For serious ascents or other activities where every ounce counts then you would be happy to live with it. For ordinary comfort on weekend expeditions and other peak-bagging then you might end up disappointed. Scoring well in all areas, the EV2 is our highest rated single wall tent. Three Atlas Scandium XL poles, 38 plastic clips, waterproof-breathable Conduit FR walls, and low stretch reinforcing panels make the tent very strong for its weight. Four pockets, two windows, five vents, translucent panels, and an integrated vestibule also make the EV2 the most livable and cheeriest single wall shelter we’ve reviewed. This tent is for high mountain, winter missions where strength, livability, and weight are of equal importance. Downsides include a canopy that is hard to tension properly and a fabric that is less breathable than those on other tents (you’ll want some wind to circulate air through the vents). On the whole, the EV2 is a marvelous shelter for demanding alpine pursuits.